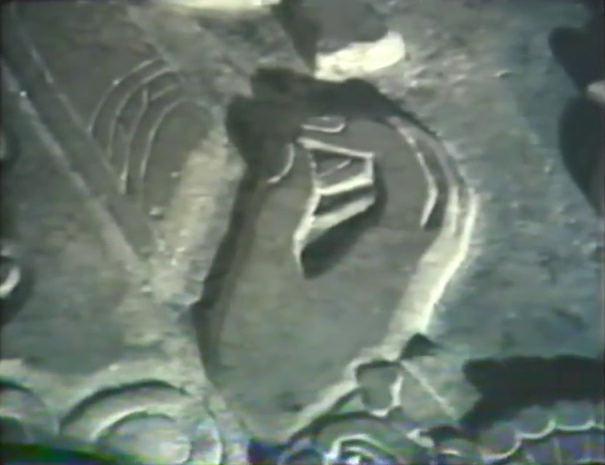 Alien Explorations: Mayan Rocket Man segment from "The Case of the Ancient Astronauts"
"The Case of the Ancient Astronauts"
underground burial chamber, elaborately carved it depicts what Von Däniken interprets in this way. Voiceover: There sits a human being, with his upper part of his body bent forward like a racing a motorcyclist today any child would identify his vehicle as a rocket. It is pointed at the front, then changes to strangely grooved indentations like inlet ports, widens out and terminates at the tail in a darting flame. The crouching being himself is manipulating a number of undefinable controls controls and has the heel of his left foot on a kind of a pedal. His clothing is appropriate: short trousers with a broad belt, a jacket with the modern Japanese opening at the neck and closely fitting bands at arms and legs. With our knowledge of similar pictures we should be surprised if the complicated headgear were missing. And there it is with the usual indentation and tubes and something like antennae on top. 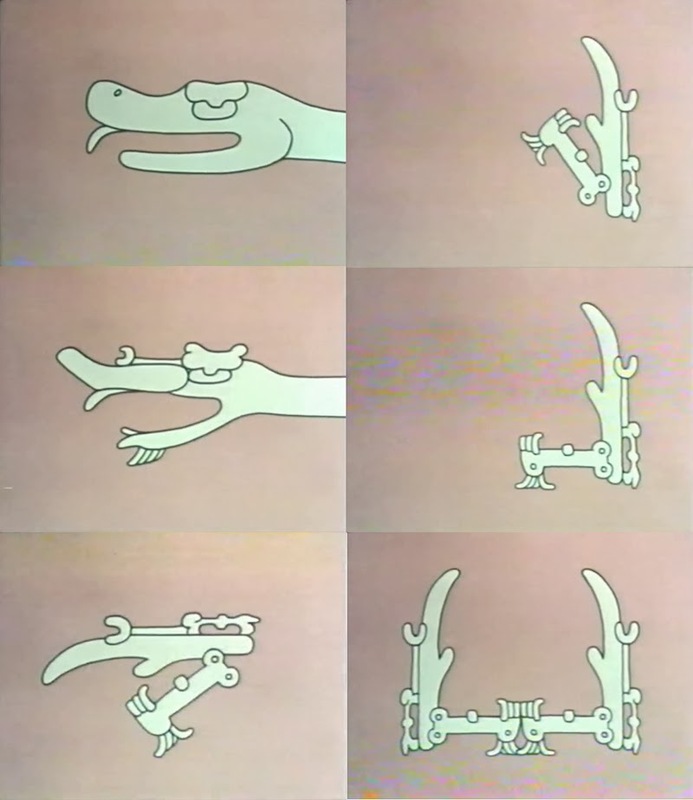 Our space traveler - he is clearly depicted as one - is not only bent forwards tensely; he is also looking intently at an apparatus hanging in front of his face. 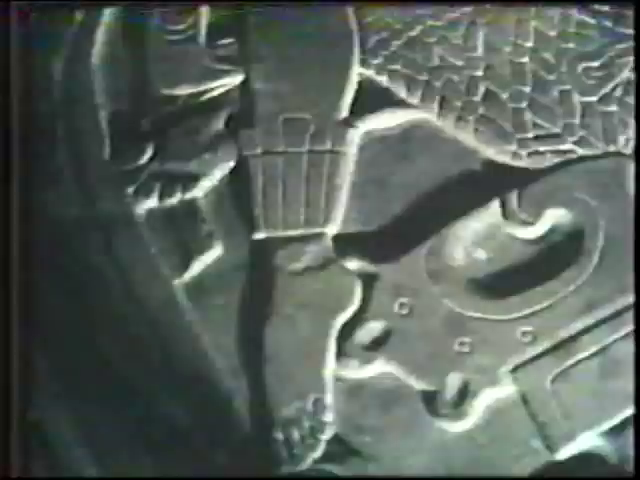 Voice over: Could this startling interpretation that this slab depicts an astronaut be a valid one? 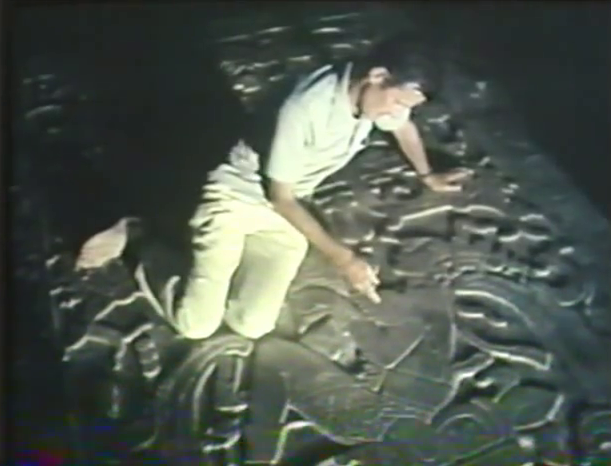 Ian Graham of Harvard Uniiversity is an expert on Mayan Symbols, his interpretation on the slab is quite different from Von Daniken's. 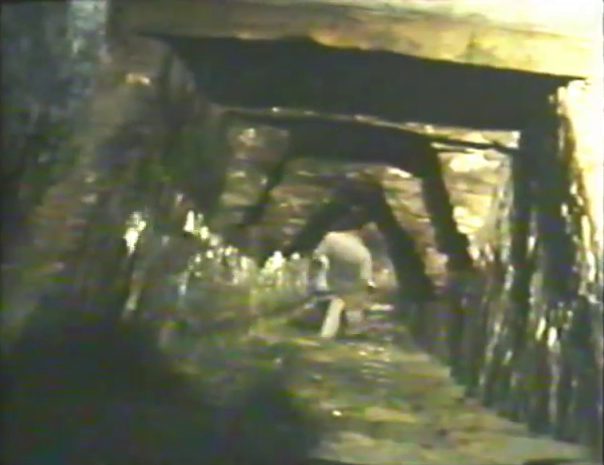 The sighting of the tomb is unusual, no other Mayan temple has a staircase like this one leading into the heart of the building, it took four years to excavate this stairway. 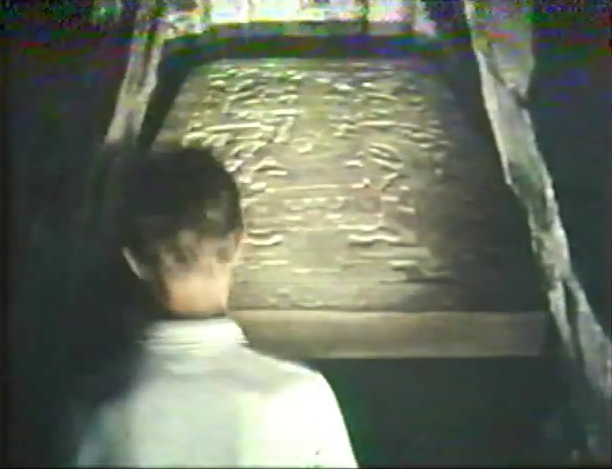 At the bottom, a stone slab concealed the doorway to an impressive tomb. 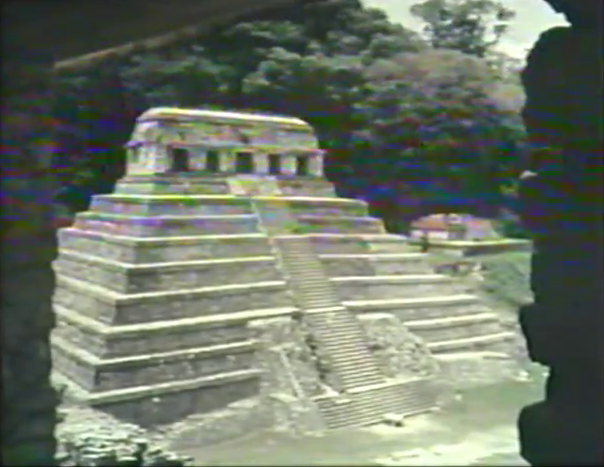 Inside was the Palenque sarcophagus. Nothing as elaborate as this had before been found. 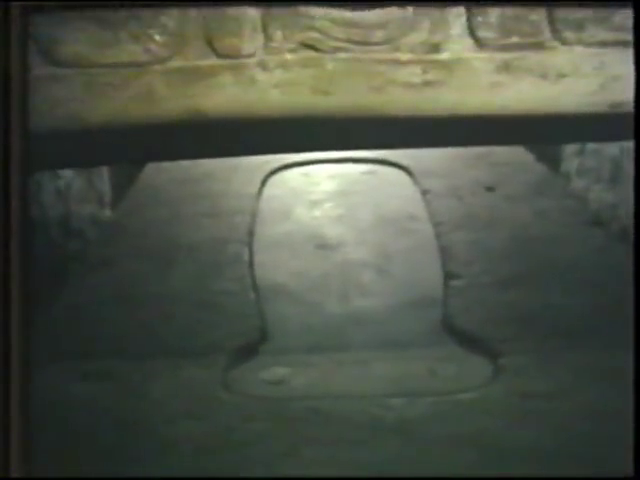 The tomb slab was raised, below it was a sealed coffin. 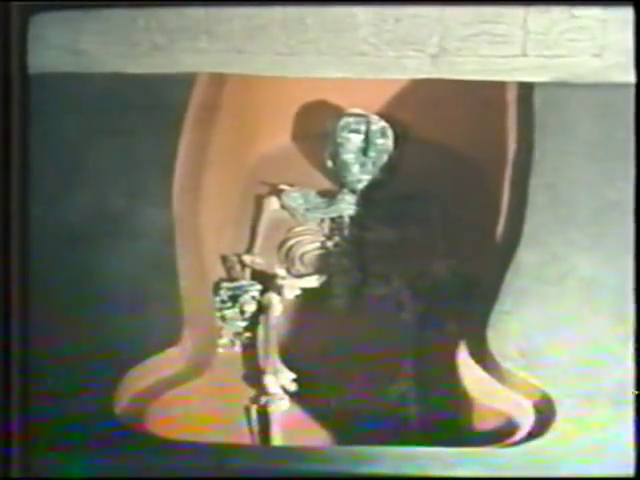 When this was opened, it revealed the skeleton of a man, richly adorned with jade ornaments. 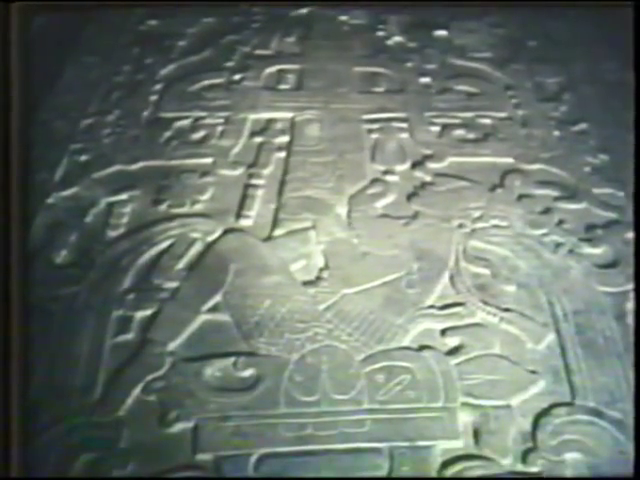 Hieroglyphics on the tomb identified him as Pacal, a seventh century ruler. This is his funeral monument. Ian Graham: Well I certainly don't see a need to regard him as a space man, I don't see any oxygen tubes. 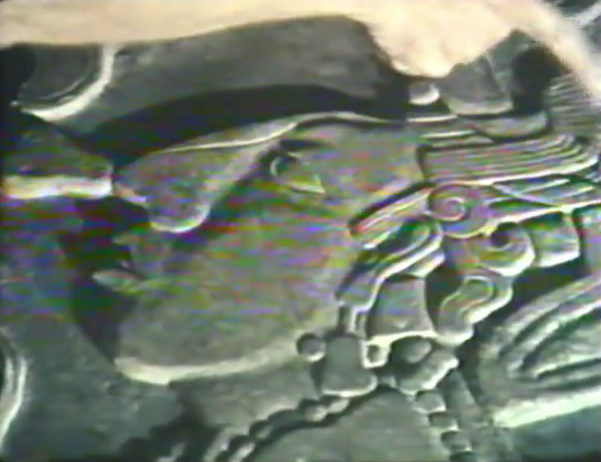 I see a very characteristically drawn Maya face with the sloping forehead which is rather common among the Maya although sometimes it's been exaggerated by deformation during early childhood, and this is crowned by an elaborate hairdo and elements of head dress, er, here an ear ring suspended from a pierced ear, a nose plug which has the elements of death because it takes the form of a fleshless bone. Here on his chest he has a jewelled pectoral ornament suspended by a chain, at the end of it which flairs out as a rather beaded chord. On his wrists, there is a very typical bracelet. Around his waist, a beaded belt with deaths head in front, and a beaded skirt which is not at all unusual and anklets likewise. Voiceover: And the hand on the rockets controls? Ian Graham:As a matter of fact it's very plain that this hand isn't holding onto anything. 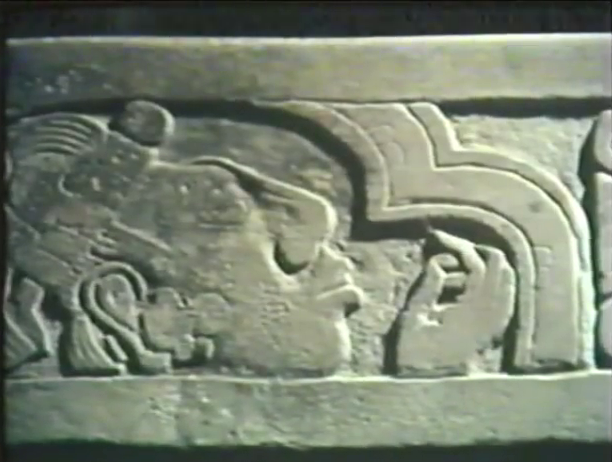 The Maya liked to show hands in rather delicate gestures, many of which may have had meanings which so far escape us. I think this is just a delicate position of the hand. Voiceover: Such gestures are common in Mayam art. There are similar examples on the side of the slab. But what about the rocket flames at the base? Voiceover: Here is the designs. Two serpents joined at the middle whose beards form Von Daniken's rocket flames. 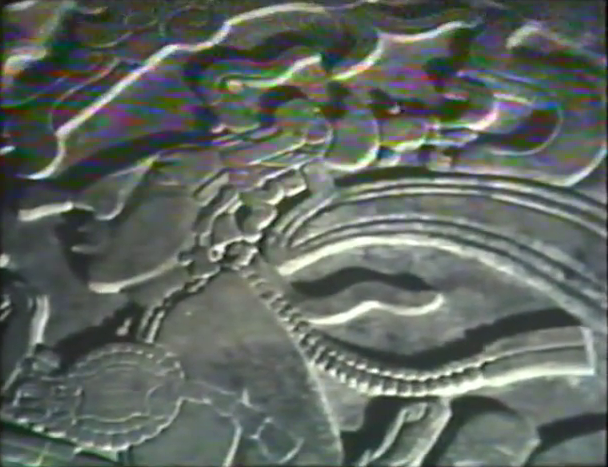 According to Ian Graham, the Maya stylised the serpent from a simple design. Eventially the serpents jaw became a rigid shape with a stylised beard below the lower jaw. The jaw is open, it forms the shape used around the design in the base of the slab when paired with its mirror image. 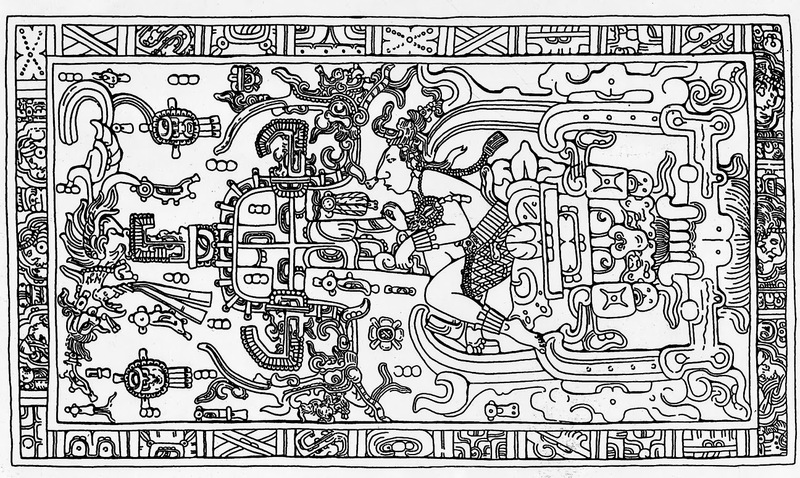 By removing the elements, the mayan design on the royal slab becomes clear, there is the Mayan symbol of kingship, a double head serpent, below it lies the dead ruler himself, and finally the two serpents that form the base, this leaves on top a bird symbolising heaven, a cross shaped device, the Mayan sacred tree supporting heaven, and below a grotesque earth monster, symbol of the underworld. 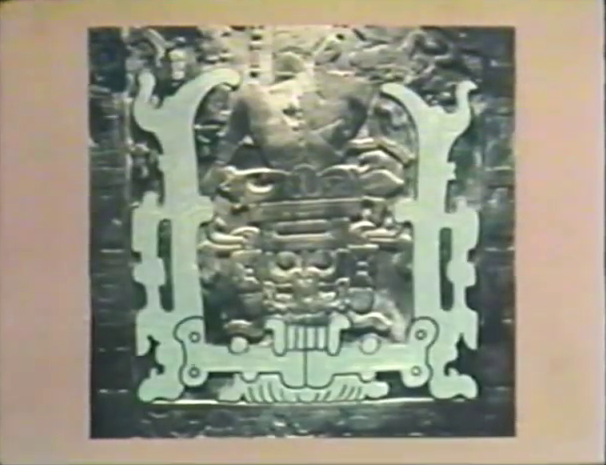 The important point is that symbols are found in other examples of Mayan art and are common throughout the Maya world. They have been studied for fifty years and tell a consistent story. 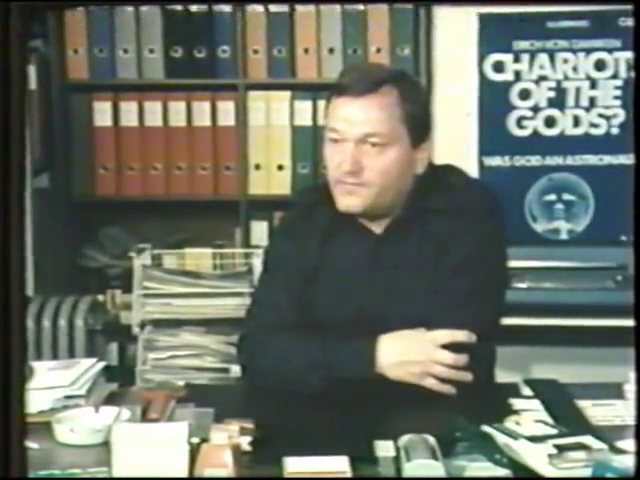 Von Daniken: I am absolutely familiar myself with the archeological explanation, but I do not agree. 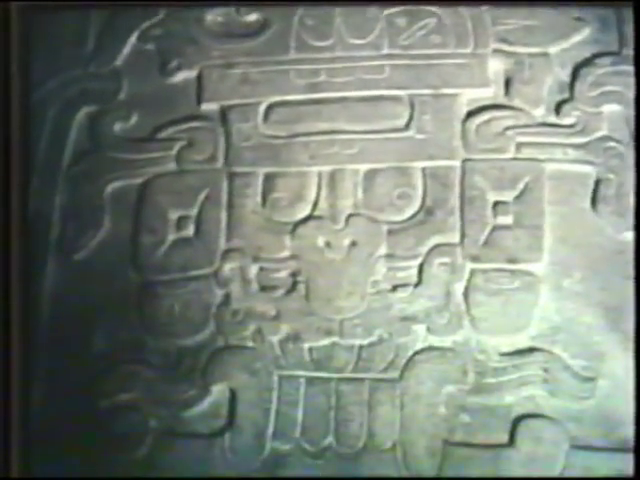 I know for sure we have in the case of the Palenque slab a lot of designs, carvings, or what the archeologists call glyphics, which we know from other Maya places, but the question I have here is "Have they been interpreted from the very beginning, correctly?" You know, er, archeology in my opinion is one of the very conservative sciences and I do not doubt, not at all, the integrity or the honesty of any archeologist, but I ask myself "do they interpret their findings correc? 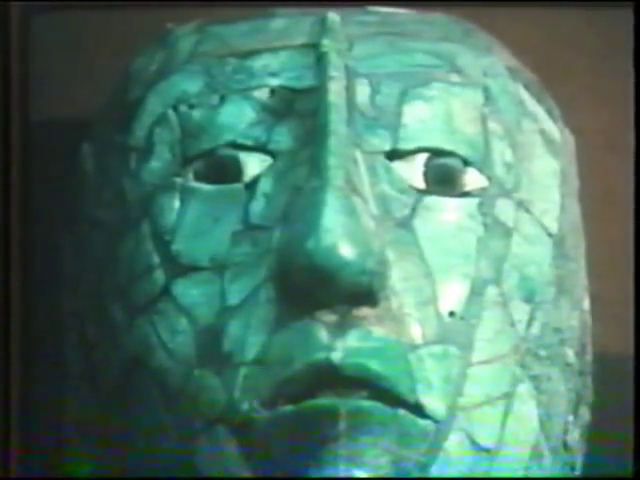 ", to my the Palenque stone still today looks like a modern man sitting inside some kind of technical apparatus, we have never found in the whole Maya literature a man sitting in the same position. It is the first and only time, so we shall wait until we find another guy like this.